While doing some research in Trader Joe’s for my previous post on Wines at Trader Joe’s, I noticed the Trapiche Broquel Malbec 2017 for $10.99. What caught my eye was how similar it is to the Kirkland Signature Malbec. Could it possibly be that the wine is made by Trapiche Broquel winery? Could it be the same wine with just another label? I set out to find out. As the back label clearly states, Broquel Winery in Mendoza makes this Malbec for Costco and it’s Kirkland Signature label. Sergio Case is the winemaker. The Kirkland Malbec is a fantastic wine bargain at $6.99. It has received accolades as well as a 91-Point rating by James Suckling. At Trader Joe’s, the Broquel Malbec sells for $10.99. I purchased a couple of bottles of each wine and set out to compare the two Malbec wines made by the same winery and winemaker. Could it be, while bottling the wine, one set used the Broquel label and then later the Kirkland label? Well, I do not believe the wines are from the same barrel lots. But, one can never be sure. For me, the taste is slightly different with the Kirkland more flavorful. The alcohol is 13.5 in the Kirkland but 14.0 for the Broquel. The wines are indeed similar, but I will give the nod to the Kirkland Malbec. It has just a little more intensity in Malbec aroma and characteristics. 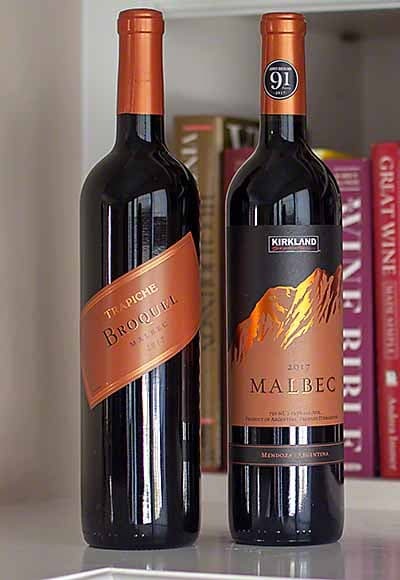 I’m going with 88 Points for the Broquel and 89 Points for the Kirkland Malbec. That $6.99 price point makes it taste better! If you happen to shop at both Trader Joe’s and Costco you might try picking up a bottle of each Malbec. What are your thoughts on these two Malbec wines? I purchased what must have been a bad bottle of the 2017 Kirkland Malbec last summer. It happens. Truly sink worthy plonk with a taste of Argentine horse stable or water treatment plant. Total surprise, as Kirkland wines are generally quite good for a value priced product. I am drinking the Kirkland Malbec as I write this. It is a very good value at the $6.99 price point. Past experience with Malbec under $10 has been poor. I found the wines tended to be “hot” similar to many low cost Zins 10+ years ago.